The Lightning stemmed from a 1947 requirement for a fighter capable of unprecedented performance. English Electric's design was so radical at the time that the Royal Aircraft Establishment took exception to some parts of it. They went so far as to award Shorts with a contract to put together an aircraft to show EE just what parts of their design were wrong. So born was the SB.5, which could have its wing sweep and tailplane position varied between flights. This first flew on the 2nd of December 1952 and by early 1954, the trials had confirmed EE's choice of low tailplane and mainplane sweep angle. The first prototype, designated the P.1, took to the air on the 4th of August 1954, piloted by Roland Beamont, EE's chief test pilot. Powered by Sapphire engines, on its third flight (on the 11th) it exceeded Mach 1 in level flight, the first British aircraft to do so. Reheat (afterburner) had not been used; supercruise was here a long time before it became an American buzz word during their ATF programme! The second prototype, the P.1A (a P.1. with twin 30mm cannon and later a bulged belly fuel tank), took to the air on the 18th of July 1955 and introduced the new aircraft to airshow-goers at that year's Farnborough show. The P.1s, while recognisably Lightning ancestors, had a number of differences in appearance. Most obviously, they had yet to receive a radar, and the nose intake was egg-shaped rather than round; looking like a basking shark's mouth. No ventral fuel tanks were fitted to start with and the vertical tail was substantially smaller. English Electric were by now working on a possible production variant, the P.1B. This had a ventral fuel tank, Ferranti AI-23 radar, raised cockpit and Avon engines. Armament had improved with the inclusion of a ventral pack to take either two more cannon, two retractable rocket packs or two Firestreak infra-red homing missiles. The vertical tail was increased in size from the fourth P.1B onwards, after some slight directional stability problems had been found when flying at high speeds. In fact, the P.1B was a very different aircraft to the P.1 and P.1A; so much so that EE had some worries that the government could cancel this 'new' project if EE presented it as such. Accordingly, the designation for this new variant was merely P.1B, which made it at least sound like a minor modification instead of a major advance. In late 1956 an order for 20 of these aircraft was placed so that testing of every aspect of the new fighter could be accelerated. EE's decision on the P.1B designation may very well have saved the project, because the 1957 Defence White Paper cancelled almost every advanced aircraft project in development, but left the P.1 alone. While the P.1 had survived the Defence White Paper, export prospects practically disappeared. In later months, the government even went so far as to sabotage English Electric's own efforts to sell the aircraft to Germany - after frustrating and fruitless attempts to sell the aircraft to the Luftwaffe, EE discovered a government representative was actually telling the Germans not to buy the aircraft! 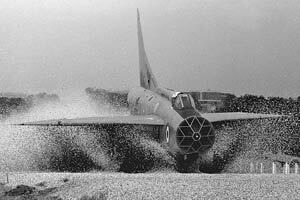 On the 4th of April 1957 the first P.1B flew. On this flight it also exceeded Mach 1 without using reheat. In July, the world air speed record (then at mach 1.72) had been broken. Flight testing was not without its mishaps; problems with the canopy release mechanism resulted in no less than three in-flight losses of the canopy. The pilots involved were lucky to survive (one canopy self-jettison occurred at supersonic speed, making the pilot, de Villiers, the fastest open-cockpit pilot in the world). Some amusement in the press was caused by these failures; Punch printed a cartoon showing the P.1 with rope wrapped around the fuselage and canopy with a caption of "Had a little trouble losing cockpit canopies, but I think we've mastered it." The Sapphire engines in the P.1A were also a cause of some dissatisfaction; for a while reheat was unavailable because of poorly performing reheat installation. The Avons fitted to the P.1B would had similar problems, and the fire warning system was unreliable too - false warnings abounded for several months until both the engines and the warning system were fixed. With performance of the aircraft better than predicted, EE designed new wings with a kinked and cambered leading edge; this gave better subsonic performance and gave a little more available space to store fuel in. These were flown on the P.1B but EE did not want to proceed with the new wings until they were absolutely sure of their usefulness, and official indifference led to the new wings not entering production until many years later. 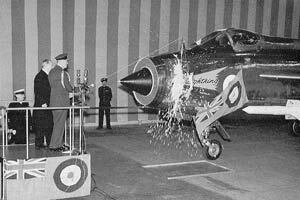 In October 1958, the RAF officially named their new aircraft - Lightning had struck. One month later, using minimum afterburner, the Lightning attained mach 2.0; thunder follows lightning! The initial requirement did not actually specify mach 2 performance, but EE had seen that it was possible and the American's F-104 programme was also progressing towards mach 2 performance. 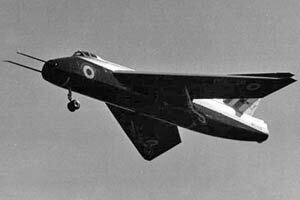 Roland Beamont later stated that the Lightning's performance at mach 2 was much superior to the F-104, with less noise and vibration and better controllability. A planned Double Scorpion rocket mounted in the rear of belly tank of the P.1B was cancelled as the aircraft's new Avon engines were found to give enough extra performance to render the rockets pointless. Besides, the space lost to the rocket and its fuel would have meant even less room for jet fuel, and the Lightning was short enough of that as it was. 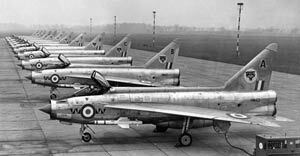 Late 1959 saw the RAF finally getting their hands on some Lightnings to trial. 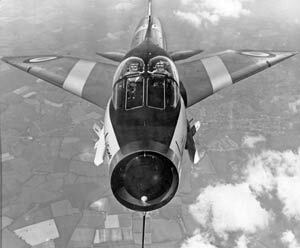 The Lightning F.1 differed very little from the P.1B; the ventral fuel tank now had a small fin, the main vertical tail was enlarged and that was about it. It entered service with 74 squadron at Coltishall in 1960, and the F.1A followed on, entering service with 56 and 111 squadrons at Wattisham. The only difference of note was that the F.1A had attachment points for an in-flight refuelling probe - the Lightning's limited fuel capacity meant that interception missions were almost limited to the area of the airfield otherwise! Variable afterburners made their appearance in the F.2 variant, which was followed by, yes, you guessed it - the F.3. The F.3 had some more major changes - improved AI-23B radar, more powerful Avon engines, a larger square-topped fin, cannon armament removed, Red Top missile capability and auxiliary overwing fuel tanks.The early days of Lightning operation were characterised by ever bolder paint schemes, culminating in 56 squadron's famous red and white-checked tails, along with a red and white arrowhead in front of the nose roundel (pictured to the right). Unfortunately the days of such brightly-marked fighters were numbered; officialdom soon decreed that the colourful squadron markings had to go, and Lightnings reverted to natural metal finishes with much more discreet and standardised markings. During their time in the RAF, Lightnings wowed airshow audiences in the UK; in 1961, an aerobatic team called The Tigers was formed by 74 squadron - nine Lightnings in formation! In 1963, 56 squadron formed an aerobatic team - The Firebirds. Taking over from The Tigers, the red and white markings of the flamboyant 56 squadron were applied to the aircraft and this, as well as the amazing displays, endeared them to airshow-goers throughout Europe. At the time, 56 squadron made much of their image, with pilots appearing in national newspapers and magazines proudly sporting the red and white checks of their squadron. The T.4 (EE designation P.11) was a trainer variant, basically a two-seat F.1A derivative. During T.4 testing it was found that a larger fin was definitely needed for this and future versions, after the first T.4, XL628, suffered major fin failure in flight. The pilot ejected successfully, landing in the Irish sea, but his emergency beacon failed to operate. As only high-level air-sea-rescue sorties were carried out, looking for the beacon's signal, he was not found and only survived because he reached shore himself a day later. Heated arguments about the lack of a low-level visual search led to the much-improved SAR operations of today. The T.5 was similar to the T.4, but equivalent to an F.3. It too suffered a similar fin failure during testing, with the aircraft lost and the pilot and observer ejecting successfully. This time they were both rescued soon after ditching. All trainer variants retained full combat capability. The accidents resulted in fins on Lightnings being strengthened. 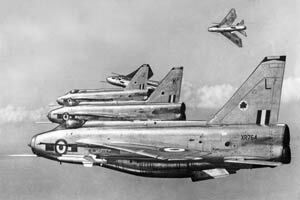 The F.6 was the definitive Lightning variant; a much larger ventral fuel tank, with twin ventral fins. Cannon armament was back along with a larger, more efficient wing with kinked and cambered leading edges. These modifications were also applied to some F.2 airframes, which then became known as F.2As. These were equivalent to an F.6 apart from not having Red Top capability. Some F.3s were also converted to F.6 standard, lacking only the overwing tanks and being briefly known as F.3As in the process, before being fully converted to full F.6 standard. Export versions (for Kuwait and Saudi Arabia) were also produced; five F.52s for Saudi Arabia (basically F.2s) and then there was the F.53 which was basically an F.6 with additional air-to-ground capability in the form of rocket pods and bombs on underwing and overwing pylons. Two T.54 (T.4s) were built for Saudi Arabia followed by the T.55, which was a super-T.5 - it had the large ventral fuel tank and enlarged wings of the F.6, while the RAF's T.5s only had the small ventral fuel tanks and straight wings of earlier variants. F.53s and T.55s for Kuwait were given a K suffix but differed little from the Saudi versions. The Saudi's F.53s saw brief action in December 1969 during a brief conflict in the South Yemen border area. 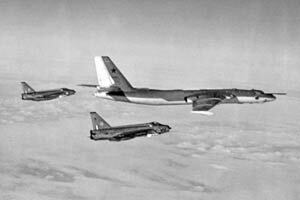 Several ground attack sorties were flown, these ending the situation almost without any help from the Saudi army. Saudi pilots loved the Lightning, and had a habit of making noisy passes over villages - with the result that many locals thought the sonic booms were a manifestation of Allah! 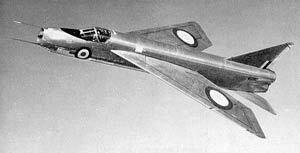 English Electric made several proposals for other Lightning variants; a multi-role version (unwanted by the MoD, but later to come to fruition as the F.53), a variable geometry variant for the Fleet Air Arm (seen here) and later there was a proposal for a much-improved F.7 variant (EE designation P.8), with variable geometry wings, extended fuselage (with main undercarriage relocated to it to clear the wings for weapon hardpoints), improved radar, intakes relocated to the fuselage sides, retractable refuelling probe, Sparrow/Skyflash capability and other goodies... but it never came to anything. BAe also offered to add Sidewinder capability to existing Lightnings, but once again the proposal was rejected on the usual cost grounds. When the Lightning was introduced into RAF service, pilots were delighted with the new fighter and had no problems converting from lower performance aircraft such as the Hunter. However, ground crew were not as happy. The Lightning was a much more complex beast than previous aircraft, and maintainer training and RAF engineering support had not caught up with this fact. In later years when this situation was rectified, Lightning serviceability was much improved (the Saudis also had few problems, though the Kuwaitis, with very poor servicing standards, rarely flew their Lightnings). Unfortunately the initial bad impressions made a big impact on the Air Staff, who then advised the government not to allow any further spending on Lightning development; the Lightning was also viewed as little more than a stop-gap until the expected advances in surface-to-air missiles led to manned fighters becoming completely obsolete. After thirteen years of service (three years after retirement had been expected), the RAF had decided that the Phantom would take over the primary air defence role. This was due to a combination of factors including the aftermath of the TSR.2 fiasco and the draw-down of the Navy's carrier force, and was no reflection on the Lightning's performance (though its lack of range meant the Phantom's medium range capabilities would be very useful). The Lightning was still a formidable opponent; even high-flying U-2 pilots became accustomed to being caught by Lightnings! Lightnings would be kept on in limited numbers, however, and a programme of modifications was carried out to strengthen them for the extra years of flying that lay ahead. Some light-hearted moments came when Lightning squadrons challenged other squadrons to races to high altitude. Having beaten the mighty F-15 Eagle to 30,000 feet (just - with a somewhat stripped down T.5! 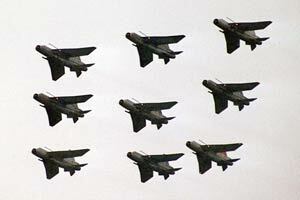 ), their come-uppance came in a challenge with a Harrier squadron. While the Lightning made the long journey to the runway from the hangar, the Harrier pilot simply did a vertical take-off and was at 10,000 feet before the Lightning had even begun its take-off roll! 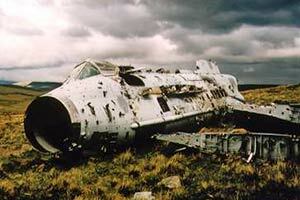 Revenge of a sort came when one lucky Lightning pilot got the chance to shoot down a Harrier - for real. The Harrier's pilot had ejected but afterwards the Harrier just kept on flying and rather than risk it crashing in an unknown area, it was shot down. The Lightning force draw-down began in 1974; the first Jaguars were being delivered, freeing Phantoms for pure air-defence. 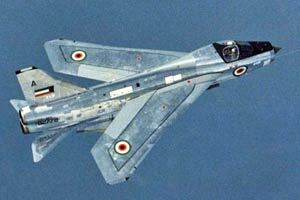 By early 1977, only 5 and 11 squadrons still operated Lightnings. By now, the natural metal finish of Lightnings had mostly disappeared - green upper surfaces were the norm for German-based aircraft which spent much of their time at low level where the silver finish was too conspicuous. Later the normal grey and green scheme was applied to match other Strike Command aircraft; but this was very much a low level/on the ground scheme and showed up far too much at high altitudes. In the early 1980s, it was realised once more than Lightnings still had some use; the Tornado ADV was late in arriving, so the Lightnings once again underwent testing to see if they could continue flying safely. They could, and did, though reserve and active aircraft underwent constant rotation to even out the usage of each airframe. Soon, a variety of different grey schemes were to be seen, to the point where it seemed no two aircraft had the same paint scheme. By 1986, the Lightning's days were definitely numbered - the RAF had announced their final retirement, which was to be in 1988. The Saudis had retired their Lightnings in late 1985 and BAe bought back the best of the survivors for possible re-sale to Austria. 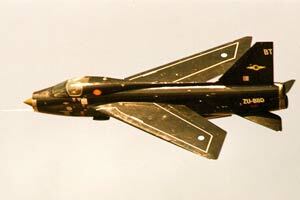 In the end the deal fell through for political reasons and Austria bought ex-Swedish Drakens instead; the ex-Saudi Lightnings then went to museums and collectors. Despite being in excellent condition on arrival in the UK, the Lightnings were not stored correctly and had deteriorated quite a bit while in BAe's hands with the result that none have been restored to running condition, let alone flying condition. In 1987 the Lightning squadrons flew their mounts to the limits of their envelopes, using up the last remaining hours of fatigue time. Many displays kept the Lightning in the public eye right until the end, with one of the biggest being the Last, Last Lightning Show at Binbrook. Dismal weather did little to dampen the proceedings, and some spectacular vapour effects were seen when the Lightnings went fast enough or pulled hard enough. 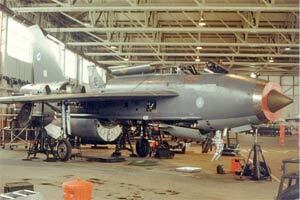 In June 1988 the last Lightning in RAF service took off for the final time, destined for a private buyer. Service with the RAF had lasted from 1960 until 1988; not bad for an aircraft that had been planned to have a service life of no more than ten years! Had it not been for the lack of fatigue life on the remaining fleet, a few more years of service could have been had; the hasty scrapping of many early marks in the 1970s was certainly a mistake! A small number of F.6s continued to fly with BAe, used for development work on the Tornado ADV programme, but these too were retired in December 1992. A long silence then fell upon the Lightning world, broken only by occasional taxi runs of a few kept in ground-running condition. Thanks to the efforts of Tony Hulls at Cranfield and Barry Pover at Exeter a handful of Lightnings were kept in such good condition that they now fly again - but sadly they're now in South Africa, far from home. The Lightning's complexity and poor safety record in service has counted against it in the eyes of the UK's Civil Aviation Authority and now there are no longer the spares or indeed any truly viable airframes left in the UK for a return to flight. Three airframes are kept in taxiable condition; The Lightning Preservation Group at Bruntingthorpe have a pair of F.6s and Russell Carpenter has a T.5 at Cranfield. While in RAF service, the Lightning never fired a shot in anger (unless you count that Harrier! ), it was possibly one of the most agressive looking aircraft ever to fly, and was certainly the backbone of the air defence of Great Britain for many years. The epitome of British fighter design - short on fuel but immensely powerful and manoeuvrable and with more character than any of its contemporaries - the Lightning was the first, and last, all-British supersonic fighter. While the Lightning's replacements (the Phantom and Tornado ADV in British service, the F-15 Eagle in Saudi service) are excellent aircraft in their own right, none compare with the sheer brute force and sparkling performance of the ultimate jet sports car - the English Electric Lightning. * The 42 F.1s included 20 pre-production development batch aircraft plus 3 static test airframes; the 29 F.1As included a single static test airframe. Externally the various variants are quite easily distinguished; there are a number of points to look for. The tip of the tail had two main styles; rounded and squared off (the latter being a larger fin altogether). The belly tank also came in two flavours, small with a single strake and much larger with two strakes. The cannon ports could be found in the nose (usually on top, but sometimes with additional ones below) or in the forward part of the larger belly tank. Early marks lacked the cable ducts running along the sides of the lower fuselage, these beginning with the F.1A variant and extending further forward on the F.3 onwards. A small dorsal scoop could be found about midway along the upper fuselage spine on the F.2 onwards. The table below simplifies matters somewhat, but there were several aircraft that differed in detail (e.g. some had cannon ports faired over when used as targets, F.6s were initially lacking cannon and so on). Also, P.1A WG760 trialled the kinked wing at one time and some development batch P1.Bs/F.1s trialled the large squared fin.